At DBS, we can inspect your foundation at no charge, providing you with a written solution that's warrantied to permanently stabilize your home's structure. Whether the problem is expansive soils or unstable soils underneath your foundation, there are effective solutions that can permanently repair your structure. At DBS, we use the following methods to restore structural integrity to compromised foundations. Foundation piers are an excellent way to stabilize and potentially lift a foundation that is resting on soils that cannot support the weight of the home. To schedule your free quote, call or e-mail us today! 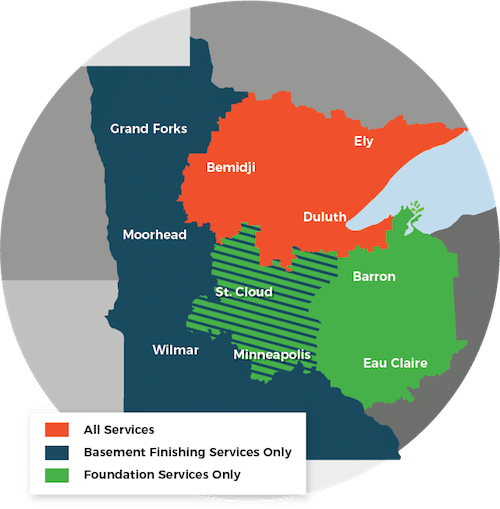 We serve Duluth, Superior, Minneapolis, and surrounding areas such as Cloquet, Two Harbors, Hermantown, St. Paul, Esko, Virginia, Ashland, and many areas nearby.